TI-25DL-MMX General Purpose Datalogging Through-Paint to 1" Wall Ultrasonic Wall Thickness Gauge Reliability Direct, Inc. Your Direct Source for Reliability, Maintenance, Test & Measurement! 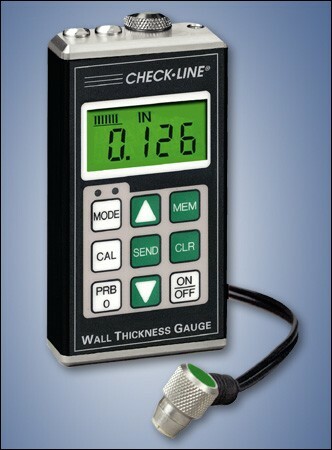 The TI-25DL-MMX Wall Thickness Gauge accurately measures wall thickness and the extent of corrosion of all metals, ceramics, glass and most rigid plastics - from only one side! measures from 0.1 to 1 inch (2.54 to 25.4 millimeters). The TI-25DL-MMX incorporates a built-in memory for 1000 data points that can be separated into 10 separate "batches." The stored data can be downloaded to a serial printer or a personal computer. A Windows compatible data transfer program is supplied at no additional cost. The TI-25DL-MMX probe is waterproof and can be submerged in water. The gauge is impact-resistant and environmentally sealed to provide trouble-free operation under the toughest field conditions. 4 ft. (1.2 m) waterproof cable with non-polarized, quick-disconnect connectors. Optional lengths up to 50 ft. (15 m).